Collection of nuptial poems, copied by Isaac Cohen Belinfante. Collection of nuptial poems, copied by Isaac Cohen Belinfante. Amsterdam, c. 1775.
f. 1r-3v: 2 poems for the marriage of Jacob b. Aaron de Prado and Judith daughter of Jacob de Prado, Amsterdam, 1775; first poem not finished. 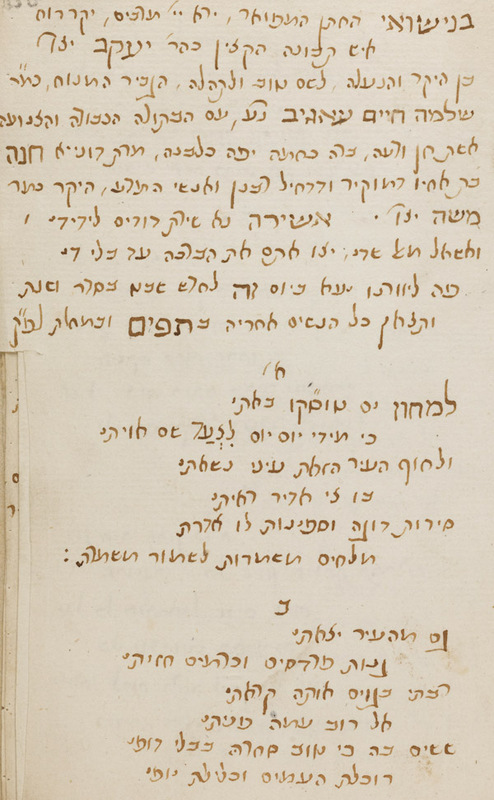 f. 4r-8v: poem for the marriage of Jacob ben Solomon Hayim Agib and Hannah daughter of Moses Agib, Livorno, 1770.
f. 9r-11v: 2 poems for the same occasion by Judah Moses Corinaldi. f. 12r-14r: poem by Hayim Telea. f. 15v: end of poem of f. 3v. Hebrew / Paper / 16,2 x 10,1 cm. /  ff. / Sephardic cursive writing / No title.